Explanation: The majestic Lagoon Nebula is filled with hot gas and the home for many young stars. Spanning 100 light years across while lying only about 5000 light years distant, the Lagoon Nebula is so big and bright that it can be seen without a telescope toward the constellation of the Archer (Sagittarius). Many bright stars are visible from NGC 6530, an open cluster that formed in the nebula only several million years ago. The greater nebula, also known as M8 and NGC 6523, is named "Lagoon" for the band of dust seen to the right of the open cluster's center. The featured image was taken in the light emitted by Hydrogen (shown in brown), Sulfur (red), and Oxygen (blue) and displayed in enhanced color. The featured picture is a newly processed panorama of M8, capturing twice the diameter of the Full Moon. 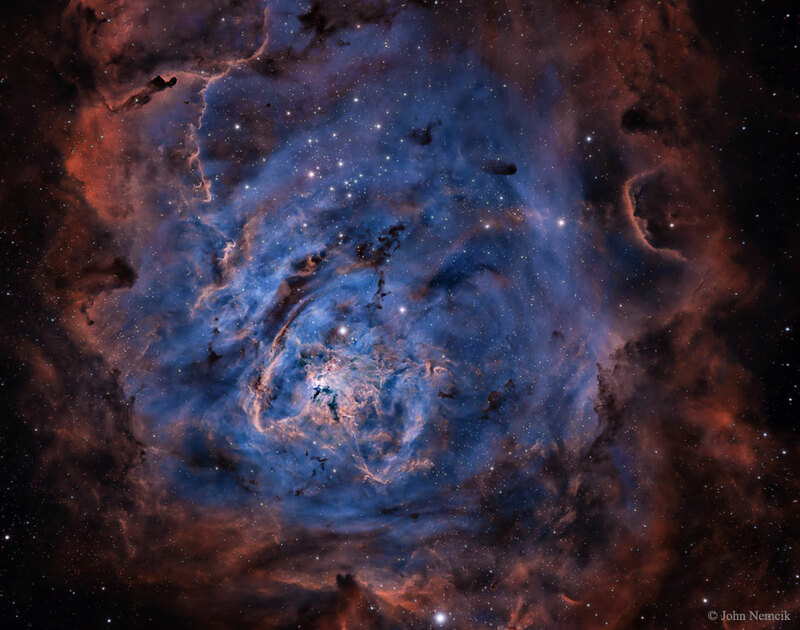 Star formation continues in the Lagoon Nebula as witnessed by the many globules that exist there.